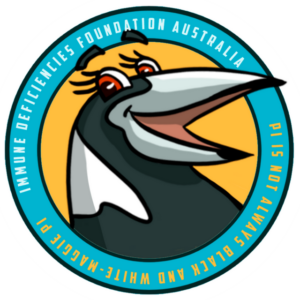 During the month of April, The Immune Deficiencies Foundation Australia (IDFA) celebrated the lead up to World Primary Immunodeficiencies Week (WPIW) with the release of several new awareness materials. IDFA’s WPIW campaign efforts where very successful, especially on social media, having so far reached 15,000 people. 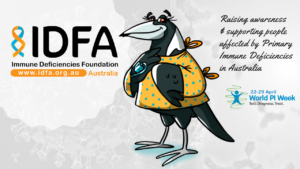 The new mascot, Maggie PI, an Australian Magpie, is helping IDFA show that primary immunodeficiencies (PIDs) are NOT just black and white. During WPIW, IDFA launched four awareness videos that can be viewed on their YouTube channel. Two young adult patients share their experience with diagnosis and treatment, the importance of being aware of the 10 warning signs and the importance of getting involved in WPIW. IDFA also launched a new 10 Warning Signs poster to spread medical awareness and increase diagnoses of primary immune deficiencies. At local level, one IDFA’s junior adult member organised five very successful school awareness days, one of which appeared both on the radio and in the newspaper.